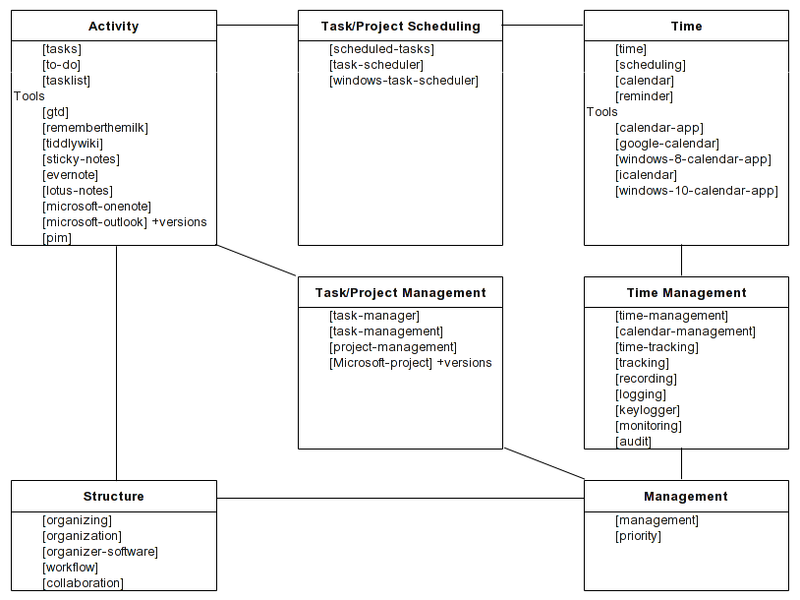 and a tag synonym request: Tag Synonym request: [tag:task-scheduler] vs. [tag:windows-task-scheduler]. We batted around a few ideas on the time management question and I went off to look at the tagged questions more closely. It turns out this is the tip of an iceberg, and we may want to look at the bigger picture. There is actually a Gordian Knot of inter-related tags that are used extensively to mean multiple, overlapping things. A substantial portion of the tags are used in multiple cells of this matrix, across any and all boundaries. Some of my category assignments are a bit artificial. In reality, many of the tags in different boxes have been used interchangeably. These tags are used in virtually every possible combination of up to 5 tags, sometimes additively to provide a more precise description, but often just to include more tags meaning the same thing. Numerous disparate uses. Many have no wiki excerpt but even when they do, the guidance is often ignored. Meta and meaningless tags that don't add value. Excessive granularity. Many of these tags may originally have been nuanced, but that has since been lost (or were originally created not realizing an almost identical tag already existed). There are a lot of candidates that can be synonomized or outright deleted. I question whether every single calendar, notes, or to-do applet needs its own tag. Is every version of MS Project and Outlook unique enough to warrant a separate tag? A number of these tags have zero followers and often a limited number of questions, which speak to its value as a tag. Perhaps we can use answers here to suggest specific strategies to chip away at this. After a little cleanup, we have 11 applet, 77 java-applet, 73 desktop-gadget, 24 widgets, and 39 bookmarklet. There are some nuanced differences, but all of these tags except bookmarklet get used interchangeably. Consider synonymizing the first four to simplify searches for answers. gadgets retagged, mostly to desktop-gadget. time is a mess and needs cleaning up, but the few human-related questions I spotted could be re-tagged time-management. tracking is a free-for-all, with almost as many uses as questions. It looks like the human-related questions can be re-tagged with other existing tags. The silicon-based questions would still need cleanup. recording The silicon-based questions would still need cleanup. logging The silicon-based questions would still need cleanup. performance This has over 2,800 questions, but just a browse indicates that these are predominantly silicon-based. multitasking The human ones turned out to be virtually all decoration. There are 10 silicon-based questions remaining. tasklist was meta and had only 7 diverse questions. I went ahead and cleaned it up. I'm no longer seeing any human-related priority questions. scheduling The silicon-based questions still need some cleanup. I thought about: What is driving these users to create these tags in the first place? Is it too easy to make tags? How can we make it harder? Creating tags is relatively low on Super User: privileges: only 300 needed. In contrast, Stack Overflow privileges requires 1500 to create tags. So on Stack Overflow, creating tags is after the "established user" at 1000. It is also after "access review queues" (at 500), which might help people get a sense of how much maintenance labor there is. On the Create Tags help, I see, "on some sites, new tags will be automatically culled and removed from the system if they are not used by at least one other question in a six-month period." Is the currently enforced number one, or zero, on Super User? Regardless, would we be better off making that "three other questions", to reduce the amount of labor that gets expended with trying to do maintenance on all these tags? multiple related tags for the same thing when they don't refine specificity and aren't likely to attract different answerers. In cases like including both organizing and organization, this is clear cut. Suggestion: Clean up the redundant tags as a first step. Then look at what's left to determine the best way to proceed. What is audit? I went to go create the tag information, but I couldn't figure out what it is. Is it audit-log? If so, for what OS? Server or local? A event-log or even logging? These and a few other tags are posted for public comment in Should we preserve these tags?. Please visit that question and vote and/or comment on the tags to provide guidance on their disposition. task-management This had just four questions, each about something totally different, so while the tag sounded good, it served no purpose as a tag. I just went ahead and cleaned this one up. management Most of these turned out to be just decoration or poor tag selection. Retagged and cleaned up. third-party Meta tag that could potentially have usage worth discussing. However, it had a small number of questions; the tag was incidental on most of them and not critical on a few disparate remainders. planning The ones that weren't decoration were poor tag choices. Cleaned up. selfcontrol Is unchanged; turned out to be an OSX app. family-safety had no wiki and contained a lot of misuse. Retagged, mostly to parental-controls. health Retagged, mostly with work-environment and ergonomics. All the tags about specific tools and versions of tools are fine. It's entirely possible for people to be experts in a specific program. If those tags are being misused, we should remove them only where they're not related, and write tag wikis when necessary. Some tags have been used to mean both a program/feature and a real-life thing, like audit, which sometimes indicates a question about the audit/logging features in Windows and sometimes decorates questions about supervision. Tags like that could be split (maybe into something like windows-auditing). In general, management is pointless, but I suspect it has questions that should be tagged with wmi or mmc. Meaningless tags like organization should just be torched. It covers so many completely different things. Questions about collaboration in a certain program should just be tagged with that program and/or the OS. Some tags, like collaboration, have the same problem, and some in this category (like time-management) are product recommendation requests. Perhaps a community wiki post would be appropriate to sort these tags into the above three categories. Many of these tags deal with topics that belong in https://productivity.stackexchange.com/.